Usually modern manufacturing automation systems consist of numerous different IT systems located at business management/operation and process control levels. It is a broad class of application domains where business IT and control systems are converged to make a large whole with the aim of improving performance as a result of the macro optimization and synergy effect. This domain is called Industrial IT. Frequently the systems are distributed geographically among multi-division organizations. To deploy the above-mentioned convergence the systems have to be integrated – they must interoperate. After integration the systems should make up a consistent system, i.e. each subsystem (as a component) must communicate with the others. The final information architecture is strongly dependent on organization, culture, type of technology and target industrial process. Communication is necessary for exchanging data for production state analysis, operation actions scheduling, supervisory control and task synchronization in the process as a large whole. Peer to peer: manually created point-to-point links to meet short-term ad hoc objectives. All in one: a product dedicated to both functions: process control and business management. Process Observer: a consistent, homogenous real-time representation of the process control layer. 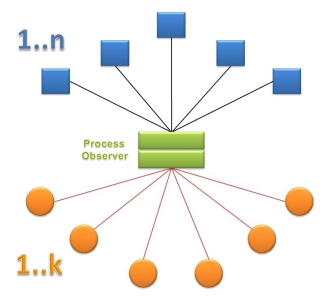 Process Observer (Fig. 1) is a kind of a virtual layer, which is a “big picture” of the underlying process layer composed of unit data randomly accessible by means of a unified and standardized interface. It allows the process and business management systems, using international standards of data exchange to share data from plant floor devices. Process Observer is like a bridge connection between the plant-floor control and the process and business management levels. Thereby, the structure of the links becomes systematic and the existing functionality of the upper layers is preserved. Using the Process Observer archetype the number of links between components can be substantially reduced and, what is very important it is a linear function of the number of nodes. Now, the links can be used to gather the process data in a unified, standardized way (see fig.2). Process Observer archetype greatly reduces the whole complexity and decreases interdependence by decoupling application associations and underlying communication routes. Additionally, it allows applying systematic design methodology and building information architecture independently of the underlying communication infrastructure. The Process Observer concept has been implemented in the CommServer™ software family. That communication server is optimized for applications in distributed process control systems. To provide a consistent sole representation of a distributed real-time process at the upper layer boundary – according to the model – the CommServer™ has to implement unique functionality, provide redundancy and optimize utilization of underlying communication infrastructure. To meet scalability and open connectivity requirements, the CommServer™ exposes the OPC Unified Architecture (OPC UA) to be consumed by upper layer applications. One of the main objectives of using the OPC UA is to provide a uniform bridge between digital plant-floor devices and systems providing services at the process and business management level. At the very beginning, this bridge was invented as a translator between vendor specific languages (protocols) used by the devices for data access and a widely accepted one – OPC. Therefore, each OPC UA server has to be equipped with a vendor specific component called DataProvider that implements selected protocol and communication infrastructure management functions. Popularity of the OPC UA standard grows, but still many applications do not support it. For that reason, another member of the family, DataPorter™ offers SQL and XML connectivity (Fig 2). CommServer™ does not only play the role of a translator and communication engine. Offering the possibility of creating simulators and publishing simulation data in the same way as the process data, the final process representation can be complemented by directly unavailable information obtained by processing current and historical values. To commence factory approval tests of any system, we need to build a testing environment. Using simulators instead of communication drivers, it is possible to seamlessly switch between production and test environments reducing the cost by order of magnitude. In a production environment, monitoring and management of the recourses that make up the information processing and communication infrastructure is often of the same importance as access to the real time process data. 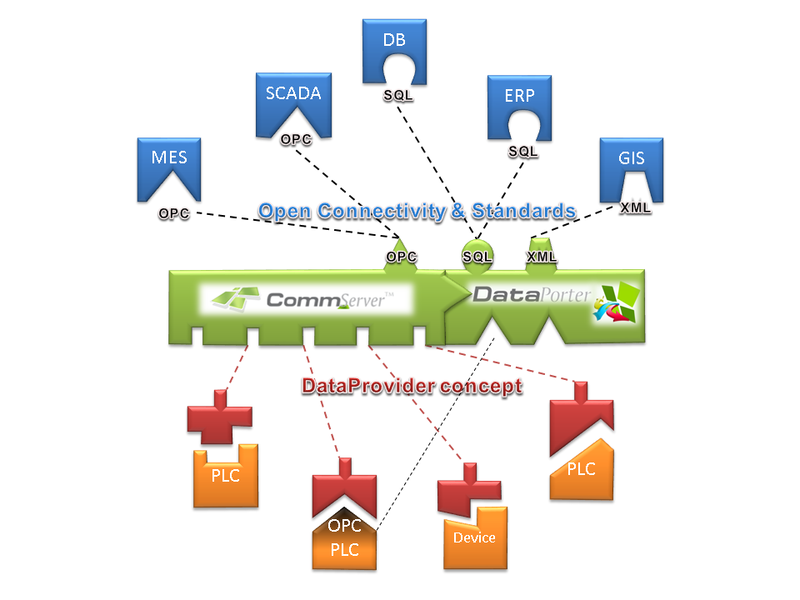 CommServer™ allows for publishing data gathered from the active network devices in the same way as the process data. It is a scenario using interactions in which one Server acts as a Client of another Server. In the presented architecture it is implemented using a dedicated OPC Classic or OPC UA DataProvider. Server to Server interactions allow for the development of servers that: exchange data with each other on a peer -to-peer or vertical hierarchy basis to offer redundancy, aggregation, concentration or layered data access management. Using the Process Observer archetype with only one common component responsible for interconnecting plant floor devices and process and business managements systems creates a single point of failure. To overcome it and eliminate the risk the proposed solution offers tree levels of redundancy to increase availability. They can be applied independently according to an appropriate analysis and assessment of the risk. Hardware: To provide true fault tolerant systems redundant hardware can be used. This solution provides the same processing capacity after a failure as before. We have two options: boxes and components redundancy. The first one is achieved by using a primary server and a backup server. We can also use fault-tolerant hardware designed from the ground by building multiples of all critical components, such as CPUs, memories, disks and power supplies into the same computer in order to ensure reliability. In the event one component fails, another takes over the communication without skipping a beat. The fact of switching from one server to the other should be transparent for the clients. Communication paths: To increase availability the CommServer™ assures redundancy of “data transmission paths”. It is designed to recover from a communication path failure by detecting the failed route and switching to another one if available. Paths redundancy improves robustness, because the same remote unit can be reached using different physical layers to eliminate single point failure dependency. The server is responsible for the selection of a route to transfer the data and to control availability of inactive paths. Duplication of the communication paths may be costly, because data transfer over distributed networks is usually not for free. The crucial feature of paths redundancy is the provision of the path multiplication without the necessity of transferring the same data over the network many times and controlling backup path availability at the same time. Signals: For reliability, this feature allows to define replicated signals. Thus, if one signal fails, a second one is available as one OPC tag. To determine whether a fault has occurred (fault detection) and which one signal is affected (fault isolation) two methods are available: source and statistical ones. Source detection relays on information about signal quality received from a plat floor device. Statistical methods use the confidence level as an interval estimate of a population parameter. Engaging of an intermediate component as a driver for plant-floor devices is a middleware archetype used worldwide in thousands of applications. Optimal Transfer Algorithm: is responsible for minimizing the difference between the individual process data update rate as required by clients and the current sampling rate of process control units.